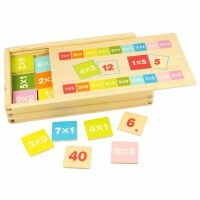 These 40 colourful wooden Kubix 40 Letter and Number Blocks with Play Mat are made by the iconic French toymaker Janod. The brightly coloured blocks have numbers or letters on all six sides which makes them very versatile for early learning. Little ones can learn their ABC's, count, build words and build structures at the same time making them the perfect early learning toy. The Play Mat folds into a carrying bag to store all the wooden blocks in when not in use and makes a 19cm cube shaped bag when folded. . Size: Cubes: 3.5cm x 3.5cm x 3.5cm. Play Mat: 60cm x 60cm.